Scrape 1 TBS. 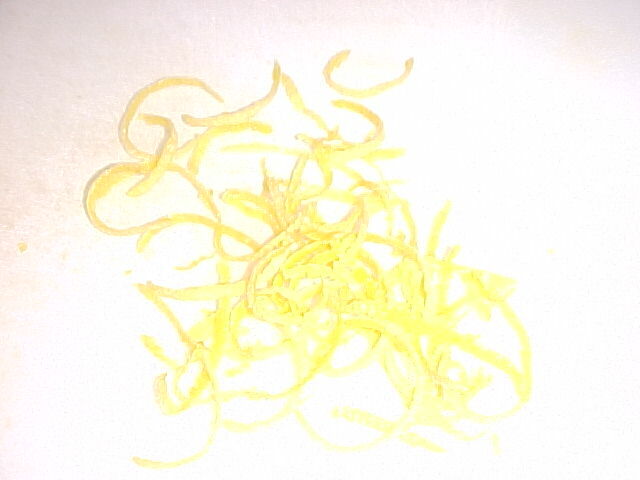 of lemon zest off of a lemon and add to the flour and sugar. This recipe works best in a food processor but could be made with a pastry cutter tool in a mixing bowl. 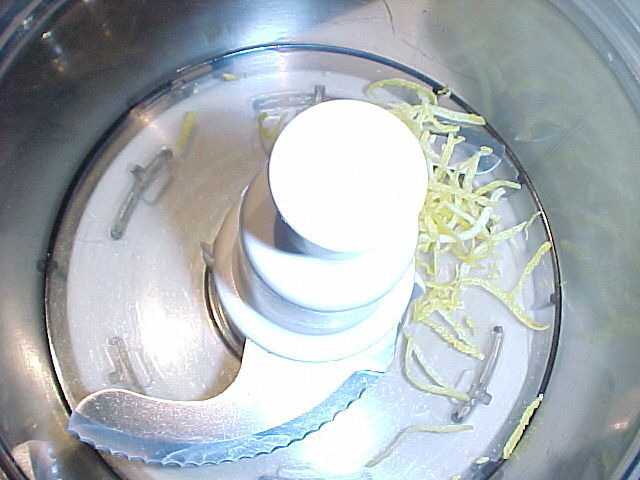 Add butter and either process with the food processor blade tool until coarse meal forms or cut with pastry cutter till you achieve the same appearance. Add the 2 egg yolks, plus 1 egg and process (or mix if not using a food processor) until moist clumps form. 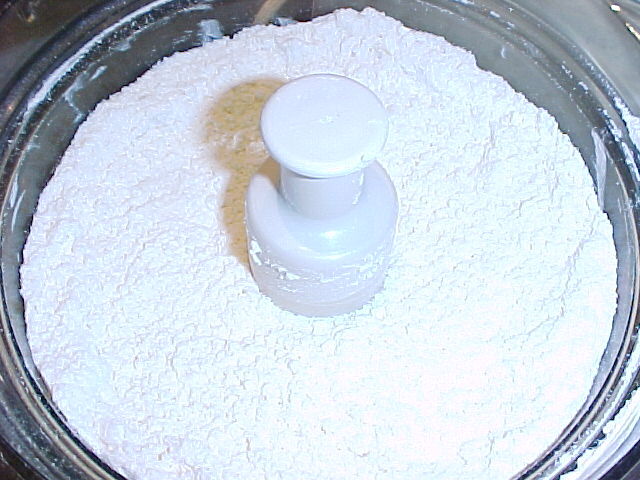 Transfer dough to floured work surface, gather into a ball and knead for one minute until smooth. 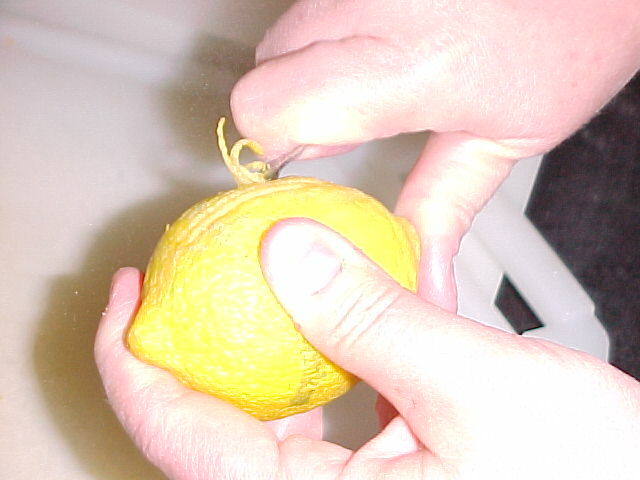 Divide dough into two balls -- one slightly larger than the other. 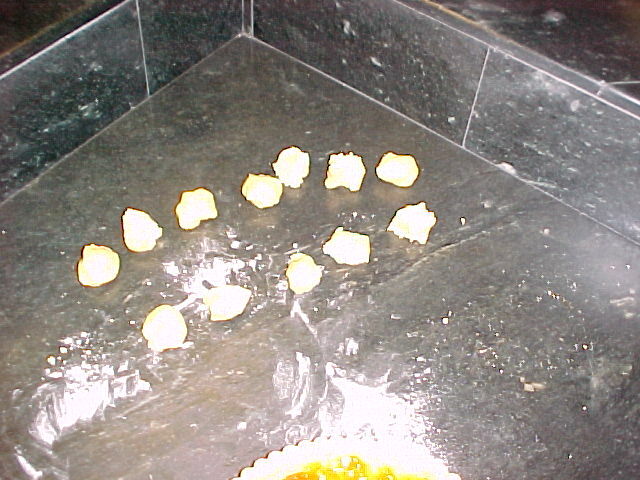 Press the larger ball of dough into your tart pan evenly and halfway up the sides. 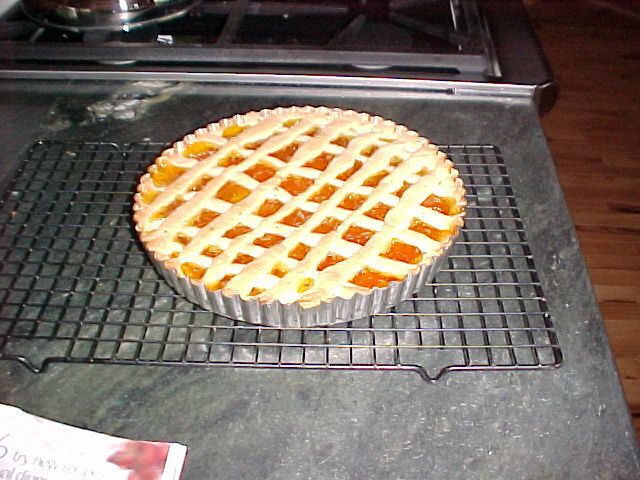 For best results, use a 9" metal tart pan with removable bottom. 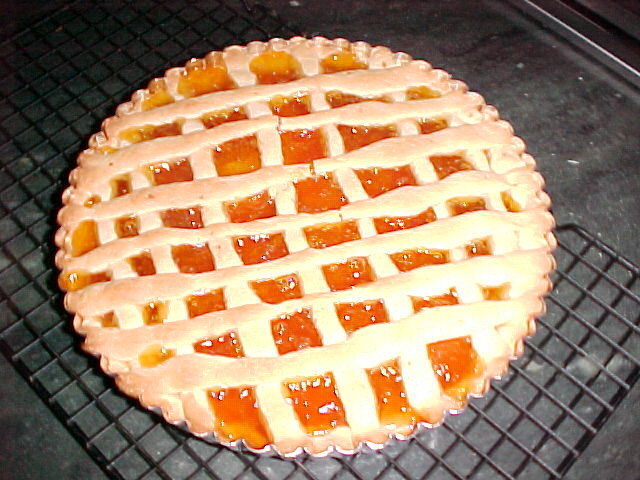 Spread 1-1/4 C. apricot preserves in the bottom of the tart shell. 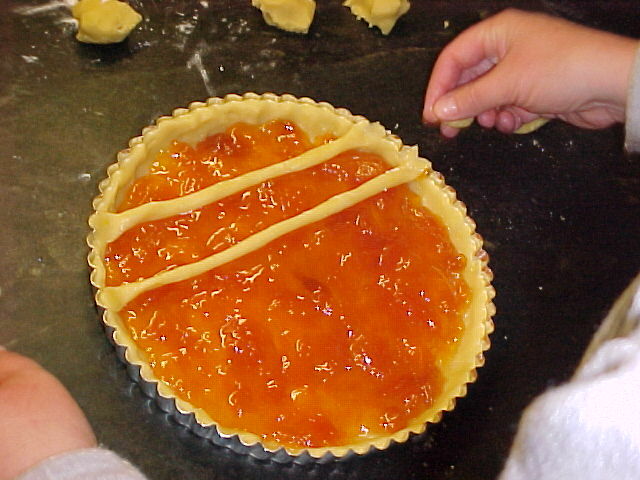 Be sure to use a good quality of preserves with a lot of apricot pieces in it for maximum taste and best results. 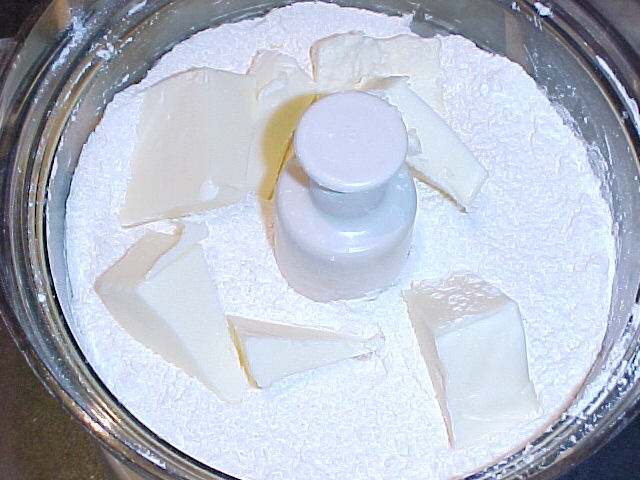 Break the remaining ball of dough into 12 more or less equal balls. These will be rolled out by hand into long, pencil-thin ropes of dough. 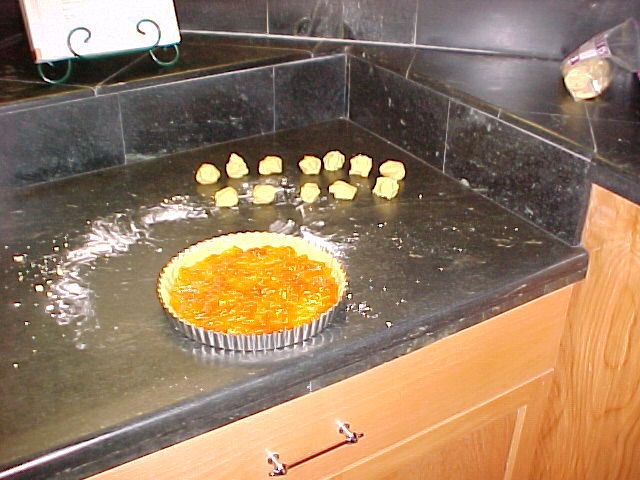 As you roll them, lay them across the tart... you will want them to criss-cross, or be a lattice work appearance, although it is NOT necessary to weave them as you would for a lattice-topped pie. Arrange 6 ropes in one direction and then lay 6 more ropes across those. You will, of course, need to use some smaller ones on the ends and longer ones across the center. Press ends firmly against the side crust to seal. 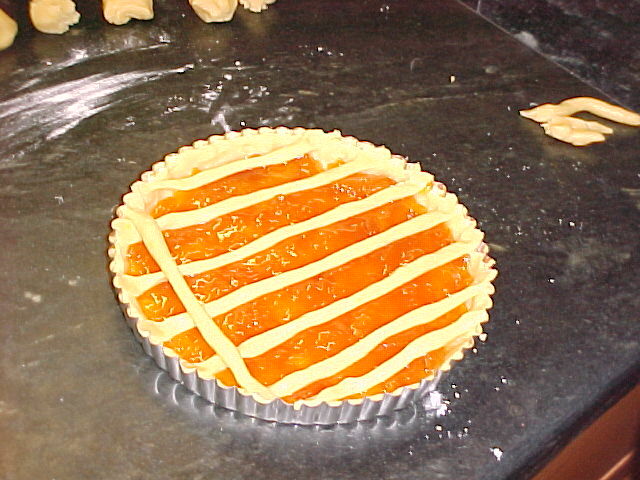 Bake tart for approximately 30-50 minutes, until golden brown. 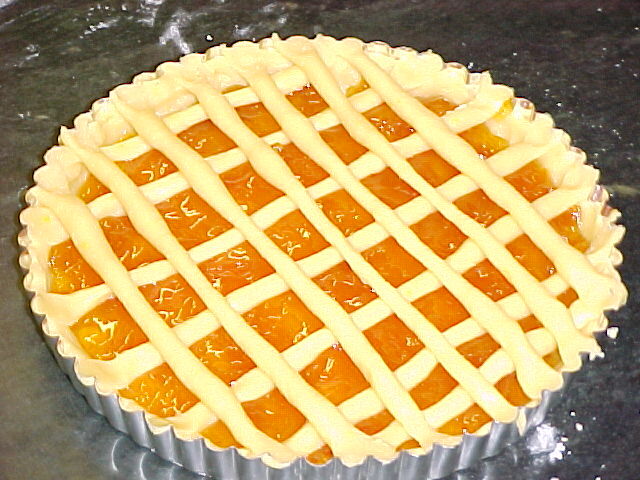 Watch it carefully, especially in the last half of the baking so that it doesn't "buckle" from the bottom. If this starts to occur, open the oven and pierce the buckled section with a toothpick or fork (using care not to disturb your lattice ropes). Remove from oven and cool in pan on a rack. Can be prepared 8 hours ahead. Let stand at room temperature. Then remove the pan sides. You may wish to lightly sift powdered sugar over tart. Cut into 8-10 wedges and serve. The crust tastes like "Walker's" Shortbread and the preserves are a perfect compliment to it. This is a great recipe to serve to guests -- it's easy and delicious!